When you consider that Jon Barry is the 4th or 5th guard that Jeff Van Gundy can turn to and he steps in and plays like that, you realize that this should be a very good year for Houston. 0-9 shooting. Welcome back Juwan, but a field goal would be nice. The season opener started out Wednesday night with Jon Barry addressing the fans, imploring them to back the Rockets the way they did the Astros in their run to the World Series. Then Barry went out and tried to earn that support. The 36-year old guard came in to the game in the second quarter, injecting life in to what was a lethargic Rocket group, and finished with 24 points to fuel Houston past Sacramento 98-89. God bless Jon Barry because as much as I love the Rockets and anticipated the opener (of what should be a very good season), they had put me about asleep by the second quarter. This just didn't look like the same team as Tracy McGrady was playing through pain and newcomers (and new starters) Rafer Alston and Derek Anderson weren't quite providing what David Wesley, Mike James and Bobby Sura were last year. The defense was lifeless as well and other than a NASTY down-the-middle-of-the-lane throwdown by Stromile Swift over Brad Miller, there just wasn't much to get pumped up about. Then Barry came in and the memories from last season came flooding back. Steals, fast breaks, running jumpers, beautiful passes, ridiculous threes... damn, that was fun to watch. If the first game is an indicator of how the season will play out, then the even better news is that Yao Ming (22 points, 10 boards) has clearly improved and looks to be a force. He was just money from about 12 feet in Wednesday and neither Miller nor Shareef Abdur-Rahim could do anything to stop him. On the other hand, Yao had no problem stopping Yao ... and that's always been the bad news. He's still picking up stupid fouls. He still can't stay on the floor long enough to be that force. He sat out over half of the first quarter as a result of picking up two quick ones and only played 25 minutes overall, finishing with 5 fouls. If he was smarter with his fouls, he could put up ridiculous numbers in 35-40 minutes a night. McGrady has me concerned. He still finished with 23 points, but was grimacing from the pain in his knees (tendonitis). He oddly missed 4 of his first 5 shots at the strip also. If he's got pain in his knees now, what will it be like by midseason? 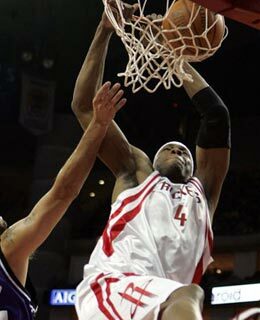 Swift was the first guy that Jeff Van Gundy turned to when Yao got in foul trouble. In fact, we didn't have a Dikembe Mutombo sighting until the third period, which was odd. Not that this needed to be said, but Swift is insanely athletic. He had two vicious dunks in the first half and got one offensive board like he was on a pogo stick. I think just about every game is going to have a "Did you see what Swift did?" moment. Still, it wasn't his best game (2-6 shooting, 2 boards in 22 minutes). Juwan Howard grabbed 9 boards, but matched that in shot attempts and misses, going 0-9. This was not the best game for Alston, Anderson and Wesley either as they combined to shoot 6-19 from the floor, though D.A. did go 2-4 from long range. Overall though, a good first win against a quality opponent. The team is clearly very talented and if the new guys can find their niche, as the supporting cast did last season, we could see great things this season.